This festive season, Central Hotels offers the most glamorous settings, extravagant menus, dazzling entertainment and exquisite service for an unforgettable celebration. Capture the magic and spectacle of the season with a wonderful selection of experiences awaiting you at Royal Central Hotel The Palm, Canal Central Hotel Business Bay and First Central Hotel Suites. Get in the spirit of the holiday season as we turn on the Christmas lights at our hotels. The sparkling decorations will transform them into an enchanting wonderlands. Sing along with carol singers as they serenade you through the beautiful evenings with Santa Claus paying a surprise visit with goodie bags for little ones. Filling the atmosphere with a sweet and spicy aroma of delicious festive treats will be the traditional Gingerbread House. On offer will be a tempting selection of yule logs, mince pies, cookies, candies, Christmas hampers and much more. Take home our traditional Christmas Turkey with all the festive trimmings to share with your loved ones. 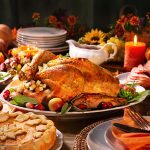 The meal includes a slow Roasted Whole Turkey with sage stuffing, golden roasted potatoes, steamed vegetables, Brussel sprouts, house made cranberry sauce and delicious turkey gravy. 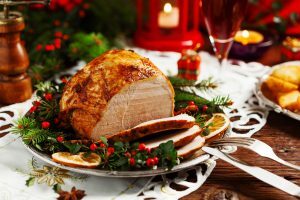 Large 8-9 kg turkey for 8 to 10 persons at AED 450. Orders require 48-hours advance notice. Gather with family and friends to enjoy a feast of festive flavours in a magical atmosphere. Our chefs will lay out an indulgent buffet featuring a wide selection of international and regional dishes including traditional Christmas favourites. Live Band Entertainment* (Subject to change). Join the Christmas celebrations with those closest to your heart at our beautiful restaurants and indulge in a leisurely buffet brunch. 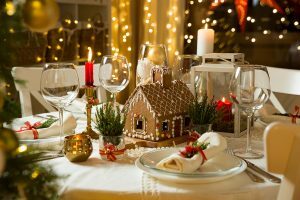 Delight in an array of traditional specialties with all the festive trimmings, live cooking stations, irresistible desserts, live entertainment and a visit from Santa. Step into 2019 with the biggest New Year bash held by the beach at Royal Central Hotel The Palm. It is going to be a celebration to rival all others in Polynesian Theme with fantastic views of the beautiful Dubai skyline along with magnificent fireworks at The Palm Jumeirah and Burj Al Arab. Soak up the gorgeous atmosphere,as we take you on a journey of sensory delights wrapped in luxury. 8.00pm: Five-piece live band kicks off the night’s entertainment at the stunning Hush Beach venue playing through until 3.00am. / Overlooking Atlantis, Burj Al Arab, Burj Khalifa. Indulge in an extravagant buffet with live cooking stations serving everything from Lobster and Caviar through to Smoked Salmon and Sushi as well as a wide selection of irresistible international favourites. The bar will be open all night serving unlimited premium alcoholic and non-alcoholic drinks including free flowing champagne. Put on your dancing shoes as the countdown to the New Year starts. Our live band will build up the tempo to take you into the New Year. Children under 12 years old can celebrate the New Year’s Eve with their parents at La Maison restaurant with their own exclusive complimentary buffet. The little ones will be able to enjoy a night packed with arts and crafts, a Trampoline, a private cinema, fireworks and live entertainment* (subject to change). Enter the New Year in style as our fabulous restaurants lay out an indulgent festive feast for the grandest New Year’s Eve Party with spectacular views of the Dubai Canal and Burj Khalifa. The exuberance of the season is reflected all around the restaurants with spectacular settings and lavish culinary spreads. The exuberance of the season is reflected all around the restaurants with spectacular settings and lavish culinary spreads. 8.00pm: Be transported to New Orleans as our five-piece live band kicks off the night’s entertainment at Lilly’s Social House over-looking the majestic Burj Khalifa playing through until 3.00am. Enjoy sweeping views of the Dubai skyline at Lilly’s Backyard. Indulge in an extravagant buffet with live cooking stations serving everything from Lobster and Caviar through to Smoked Salmon and Sushi as well as a wide selection of irresistible international favourites. Our culinary team will ensure that your dining experience is exceptional in every way. The bar will be open all night serving unlimited premium alcoholic and non-alcoholic drinks including free flowing champagne. Put on your dancing shoes as the countdown to the New Year starts. Our live band will build up the tempo to take you into the New Year. Children under 12 years old can celebrate the New Year’s Eve with their parents at La Cruise in their own complimentary exclusive Buffet. The little ones will be able to enjoy a night packed with plenty of fun and live entertainment. Join us with your loved ones for an unforgettable year-end celebration. Surrounded by festive cheer, feast on the finest food as you soak up the gorgeous atmosphere. Kick off the party with an extravagant buffet including live cooking stations and wide selection of irresistible international favourites. Entertaining you throughout the spectacular evening will be fantastic entertainment. As the countdown to the New Year starts, the celebrations heat up and when the clock strikes twelve, our DJ will build up the tempo to take you into the New Year. Children under 12 years old can celebrate the New Year’s Eve with their parents with their own complimentary exclusive Buffet. The little ones will be able to enjoy a night packed with plenty of fun. Join the New Year’s celebrations with those closest to your heart and indulge in a leisurely buffet brunch. Delight in an array of traditional specialties with all the festive trimmings, live cooking stations, irresistible desserts and live entertainment (subject to change). 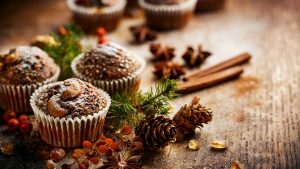 Celebrate Orthodox Christmas with a special brunch buffet featuring the most authentic traditional Russian specialties and a variety of international dishes as well as indulgent desserts.